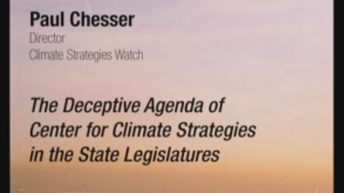 Paul Chesser is director of Climate Strategies Watch, which assesses the development of global warming policies in the states, and a contributing editor for Carolina Journal, specializing in investigative journalism and opinion writing. He came to the John Locke Foundation in 2001 after serving as editor for two weekly community newspapers. Chesser’s articles have appeared in a wide range of U.S. media outlets, and he is a regular contributor and blogger for American Spectator Online and the Cooler Heads Coalition. In 2002, he served as one of The Charlotte Observer’s monthly community columnists. His opinion articles and reporting also have appeared in dozens of other newspapers nationwide. Chesser also has appeared on NBC’s “The Today Show” and as a talk radio guest on stations across the country.